I spent my first day in Housekeeping and Laundry at Concord Health & Rehabilitation Center, our beautiful 93-bed nursing home in Wheelersburg, Ohio. My journey as a nursing assistant has made such an impact on me and I’m continually blown away by the quality of caregivers I’ve been meeting throughout the Foundations Health nursing facilities that I wanted to meet some of our other outstanding team members and work alongside them. Sue Morgan is the Housekeeping and Laundry Supervisor at Concord and I’ve known her since 2010. She has been a housekeeping and Laundry supervisor since 1985. One thing that I’ve always been impressed with about Sue is how I’ve never been in her building when it wasn’t immaculate and odor free. Today I learned first-hand why. Sue has high standards and her team (Christina, Lori, Kin and Julie) have just as high of standards. They want their residents to have a clean and enjoyable environment. Besides the regular cleaning that they perform on their units each of the girls would do a deep cleaning of one room on their unit each day. I had the privilege of doing three of them, two with Lori and one with Christina. 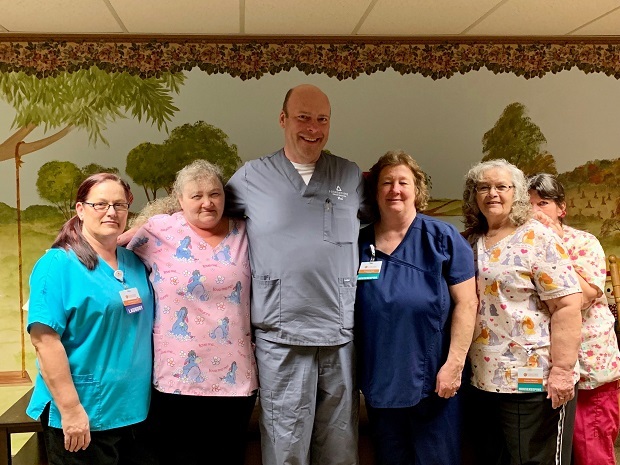 In all honesty it was a great experience to see the pride and attention to detail that these women took to make sure the resident’s rooms were thoroughly cleaned. We move the furniture to the center of the room, cleaned the perimeter of the room, removed items from shelves and wipes down the shelves, pictures, lights, mattress, bedframe, everything. We finished by thoroughly mopping the room. As we worked, we chatted about their job and how they enjoyed the residents and how they would jump in as needed to assist with an activity, pass a tray, pick up trays, or anything that might be needed. They were invested in the facility, their team and their residents. I began to see how their role in the care of our residents was just as significant as that of the nursing assistants and nurses. I got to thinking on my drive back to Columbus how we each have our roles and jobs to do. If one department doesn’t do its job, the facility and the residents suffer. But when we all work together as a team it’s amazing what we can accomplish. It’s the difference between listening to two trumpets playing two different songs at the same time and an entire orchestra playing the same score together. Sue, Christina, Lori, Kim and Julie – Thank you for reminding me today how important every department is in our Culture of Care.